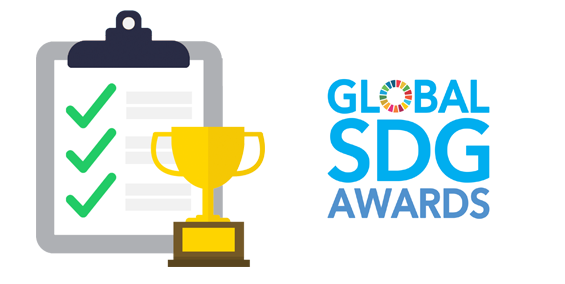 The Global SDG Awards is an international sustainability initiative designed to increase private sector engagement with the United Nations Sustainable Development Goals (SDGs) framework through competition. 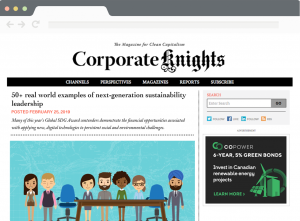 Below, you can find a collection of news stories, publications, and our sustainability thought-leadership resources. 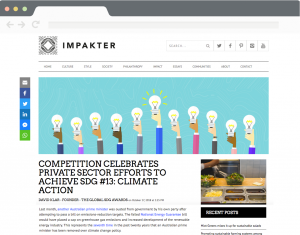 The Global SDG Awards has been featured in Sustainable Brands, Global Citizen, Corporate Knights and Impakter Magazine. Are you a journalist or media organization interested in covering the awards? Please visit our contact us page for more details. In July 2018, the 2018 High-level Political Forum on Sustainable Development (HLPF) highlighted the positive impact that technological innovation can have on the SDGs. Digital technologies in particular, have the potential to transform the current trajectory of the SDGs. A recent study by the Global e-Sustainability Initiative – a collaboration of major ICT companies and industry organizations – found that at least 11 out of the 17 SDGs are positively connected to digital access. We may take technology and the wealth of digital information available for granted, but the proliferation of these tools can help to reduce inequalities and improve quality of life around the world. Many of this year’s Global SDG Award contenders demonstrate the transformative quality of new technologies [read more]. Earlier this year, I was published for the first time in Corporate Knights magazine. 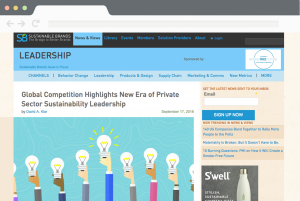 In “Celebrating The Next Era of Sustainability Leadership”, I outlined my perspectives on the evolution of sustainability leadership and the potential for the SDGs to become a common language for the entrepreneurs, corporate intrapreneurs & investment firms that are leading this new wave of change. 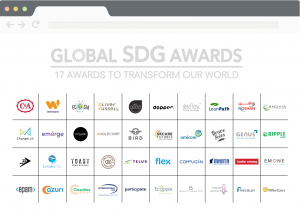 These beliefs underpinned the development of The Global SDG Awards – a platform developed to support, nurture & reward companies for their sustainability leadership. Today, I’m proud to reveal a sneak peek of the candidates participating in our 2018 competition. Please take a moment to learn more about the incredible companies that are inspiring and influencing real, systems-level change [read more]. “Water is everybody’s business.” This was the first sentence from August’s World Water Week 2018 report. 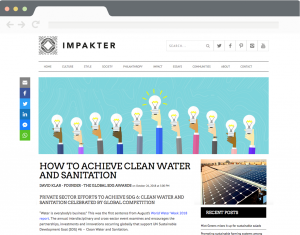 The annual interdisciplinary and cross-sector event examines and encourages the partnerships, investments and innovations occurring globally that support UN Sustainable Development Goal (SDG) #6 – Clean Water and Sanitation. Throughout the discussions – in which a record number of attendees from research institutions and both public and private sectors participated – two facts were clear. The first was that investing in water will be central to achieving the 2030 Development Agenda. Secondly, at current investment rates, we are unlikely to achieve key SDG targets related to water and sanitation. A 2017 report jointly commissioned by WBCSD, WaterAid and the UN Global Compact supports the importance of achieving Goal 6 [read more]. Last month, another Australian prime minister was ousted from government by his own party after attempting to pass a bill on emissions-reduction targets. The failed National Energy Guarantee bill would have placed a cap on greenhouse gas emissions and increased development of the renewable energy industry. This represents the seventh time in the past twenty years that an Australian prime minister has been removed over climate change policy. More recently, the Trump administration (which famously withdrew the United States from the Paris Agreement in 2017), just ended an Obama-era methane regulation covering public lands. Across the border, the Pan-Canadian Framework on Clean Growth and Climate Change has also seen significant opposition [read more]. Armed with the UN’s Sustainable Development Goals (SDGs), businesses from across the globe are leading the way to a more sustainable future. The SDGs are becoming a common language for describing sustainable market opportunities and corporate responsibility efforts. 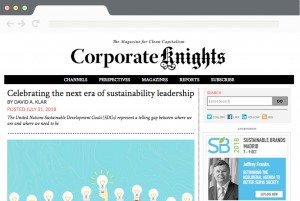 Many companies working towards the SDGs are not household names yet – but they deserve to be recognized for their efforts and incredible positive impacts. Consider companies such as Opus 12, Climeworks and Blue Planet, whose technologies capture CO2 emissions and transform them into usable materials such as petrochemicals, jet fuel and other useful products; or solar energy companies such as The Sun Exchange and Off-Grid Electric, which use technology to provide clean, reliable and affordable energy to those in need. [read more]. On March 20th, 1987, former Norwegian Prime Minister Gro Harlem Brundtland sat down to author the chairman’s forward for Our Common Future. The report, commissioned by the United Nations, was intended “to re-examine critical environmental and development problems around the world and formulate realistic proposals to address them”. On that day, Brundtland wrote “the environment is where we all live; and development is what we all do in attempting to improve our lot within that abode. The two are inseparable”. Since the publication of the Brundtland Commission Report, radical environmental attitudes have been largely replaced by reformist ideas contained within sustainable development. Sustainability has become the most dominant environmental discourse, replacing the prevailing survivalist viewpoints of the 60s and 70s (see Silent Spring & The Limits To Growth) [read more].